SAN DIEGO, California – Petco Park, home to Major League Baseball’s San Diego Padres, recently took a bold step toward delivering on its dedication to “Creating Major League Memories” as systems integrator Daktronics installed an all-star lineup of standard-setting audio equipment featuring HARMAN components. The facility, which opened in 2004, seats 42,445 and calls itself “The World’s Best Ballpark in America’s Finest City,” is now equipped with HARMAN’s JBL Professional loudspeakers, Crown amplifiers and BSS Audio processing components. 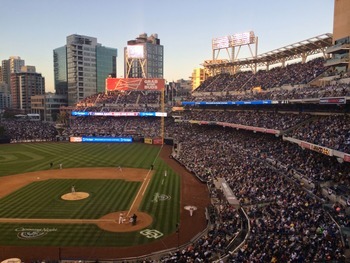 David Sturzenbecher, audio project engineer, and the Daktronics Audio team’s first step in the extensive Petco Park audio retrofit was evaluating the state of the previous system by testing every amplifier’s voltage gain and frequency response. Petco Park has two large amplifier rooms, each with 80 amplifiers, and up to 30 amplifiers in each of six smaller rooms. Daktronics Audio replaced each of the older amplifiers in the smaller rooms with Crown DCi amplifiers; the upgrade to the Crown DCi amplifiers in the larger rooms is ongoing. Featuring Crown’s DriveCore™ technology, the DCi series is more powerful and energy efficient then other large-scale install grade amplifiers and are just 2U rack spaces high. While the sound requirements for most of Petco Park are on a grand scale, the facility does have a number of restaurants and bars that called for a lighter touch. To accommodate those areas, Sturzenbecher augmented the BSS Audio BLU-800 processers already installed throughout the venue by adding BLU-320 devices in the park’s more compact sections. “The BLU-320 provides the preamps for local audio input, but also provides the BLU link source for each local amplifier room,” he said. “The Soundweb London processors were programmed so that mix engineers can monitor any audio signal in the park from the control room.” In the Bud Patio area, Daktronics installed three JBL Control 29AV-1 loudspeakers and, for Hodad’s Restaurant, eight JBL C29AV-WH-1 70V loudspeakers. The lodge, restaurant and the Pier and Hall of Fame bars use Crown DCi 2I600N amplifiers. The equipment inventory of HARMAN products that Daktronics installed in various areas of the park is extensive. On the Toyota Terrace, 19 JBL PD5322/95-WRX-WH weather-protected loudspeakers were installed. For the outer concourse, Sturzenbecher selected 30 JBL AWC129 all-weather loudspeakers with 70V transformers and two Crown DCi 2I1250N amplifiers. To fill in gaps in the concourse, two JBL PD5322/43-H-WRX weather-protected loudspeakers, two JBL AM5215/66-H-WRX weather-protected loudspeakers, powered with four Crown DCi 2I1250N amplifiers. On the park’s upper deck, Daktronics installed a complete replacement, including 26 JBL PD5322/64 WRX-H-WH weather-protected loudspeakers, 26 JBL AM5215/26-H-WRX weather-protected loudspeakers, 26 AM5215/95-H-WRX weather-protected loudspeakers and 23 JBL AM5215/00-H-WRX weather-protected loudspeakers. Daktronics outfitted the Right Field Budweiser Scoreboard and Budweiser Patio Addition with four JBL PD5322/64-WRX-H-WH weather-protected loudspeakers, five JBL AM5215/26-H-WRX weather-protected loudspeakers, one JBL PD5215/95-WRX-H-WH weather-protected loudspeaker and, for the right outfield rear fill, seven JBL C29AV-WH-1 loudspeakers; the area is powered with a Crown DCi2I1250N 2 Channel amplifier. For the owners’ suites, Daktronics installed 12 JBL C29AV-WH-I weather-protected loudspeakers. This deployment is also one of the largest to date of HARMAN HiQnet Audio Architect™ audio system design and configuration software, which retains the workflow-centered philosophy first introduced in HiQnet System Architect™ but also incorporates the BSS Audio Soundweb London DSP functionality to combine the power of the open-architecture platform with equally powerful microphones, amplifiers and loudspeakers.